With Oman becoming the first GCC country to set up a consulate in Lithuania, the two countries are looking to work very closely on political, economical and cultural ties. Boleta Senkiene, who took over as honorary Consul of the Sultanate of Oman in Lithuania in December 2013, said, "We are keen on letting Oman know that we can offer expertise and cooperation in sectors such as ICT, agriculture, medical and education. We are a strong economy and proud that we have achieved a lot within 23 years of gaining Independence." Senkiene, who is on a visit to Oman, met with authorities from the Ministry of Education, Ministry of Health, General Reserve Fund, Higher Education Council and Ministry of Transport and Communications, among others. It was the ICT sector that opened the door for Lithuania to come to Oman. Senkiene explained, "Lithuania is known for its specialists in the ICT sector, so the first connection to Oman was through this sector. Three years ago, IT companies from Lithuania attended the Comex exhibition. We came the next year and since then, have been working closely with the ITA. "This helped the two sides to take the ties to the next level. "An ITA delegation from Oman is set to visit Lithuania soon and an MoU with its counterpart in Lithuania is expected," she said. Stating that Lithuania has much to offer in the ICT sector, Senkiene said, "I encourage companies from Oman to explore ICT in our country in a big way since we have a lot of know-how." Senkiene informed that Lithuania can offer expertise in the area of agriculture since it plays a crucial role in the economy of the country. "Lithuanian minister of agriculture is expected to visit Oman soon. When he is here, he can present the country in this sector," Senkiene said. Medical tourism is another sector that Lithuania is famous for. "We are aware that Oman sends a lot of its people abroad for treatment. Lithuania could be the country for healing serious diseases. Our doctors and nurses are known for their high customer service quality," she said, while adding that plans are underway to establish a medical centre in Oman. She also informed that Lithuania is known for its wellness treatment centres. 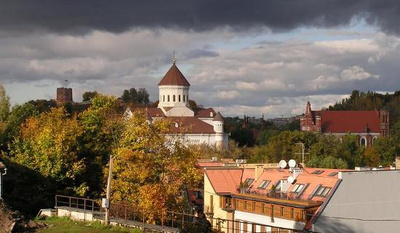 Despite being a small country, Lithuania has much to offer the tourists, she said, adding, "We have a rich culture and architecture, museums, parks, beautiful landscape with lakes and rivers." The prime minister of Lithuania has staked his job on the Baltic country successfully joining the euro next year in a bid to quash suggestions from some lawmakers that it should delay signing up. Algirdas Butkevicius said he would resign if Lithuania did not join the single currency on January 1 and stressed that all parties in his centre-left coalition were committed to a 2015 entry date. Lithuania is seeking to become the 19th member of the euro and is the only one of the three Baltic States not currently in the single currency. Latvia joined earlier this month, following in the footsteps of Estonia, a member since 2011. Despite the turmoil associated with the EU’s currency union in recent years – and the need to contribute to government bailouts – all three Baltic countries still see euro membership as part of their integration into the institutions of Western Europe and a way to counter the influence of their much larger eastern neighbour, Russia. “It has a symbolic connotation: we see ourselves [being] as integrated as possible into Europe,” Rolandas Krisciunas, Lithuania’s vice-minister for foreign affairs, told the Financial Times last month. Lithuania holds the dubious distinction of being the only country thus far turned down for the euro after its inflation rate was marginally too high in 2006. Asked if he would resign if Lithuania failed to make it again, Baltic News Service reported Mr Butkevicius as saying: “Naturally there can be no doubt about that. I can confirm that looking you in the eyes.” Lithuania’s preparations for an application this spring to join the euro were thrown into doubt a week ago when the speaker of the country’s parliament said the Baltic country was not ready. Loreta Grauziniene sowed confusion when she said on television that issues such as pensions, wages and the size of the public sector meant Lithuania should not join in 2015. She also said that the four parties in government had not signed off on the date. But Mr Butkevicius removed any doubt on Tuesday, saying: “Lithuania will have the euro on January 1 2015 – and this coalition will implement this.” Public opinion is also a problem in Lithuania with a recent poll suggesting that 42 per cent of people thought entering the euro in 2015 was unrealistic, against 37 per cent calling it realistic. Vilnius, however, can draw succour from its northern neighbour Latvia’s successful switch to the euro two weeks ago despite low levels of public support. Valdis Dombrovskis, Latvia’s outgoing prime minister, offered Mr Butkevicius help via Twitter: “Latvia stands ready to support our neighbours with our experience.” Latvia’s finance minister, Andris Vilks, told the FT recently that Russia’s pressure on Ukraine showed the wisdom of embracing the euro and EU. “Russia isn’t going to change. We know our neighbourit is very important for the countries to stick together, and with the EU,” he said. According to Lithuania's Speaker of the Seimas Loreta Grauziniene, the priority of the spring session which was to commence in March was the compensation of the pensions. "It was agreed that the Pension Compensation Working Group had to end its work by the end of January. It had to present the variants of the solution for the political discussions. In the spring session in March, the law drafts and the legal acts have to be presented. If it is agreed on and the Government approves of, I, as the speaker of the Seimas, will consider it my duty to discuss this issue at the very first sittings, so that the process of the compensation of the pensions would start as soon as possible," said Grauziniene after the sitting of the Board of the Seimas on Friday. According to Grauziniene, LTL 178 million (EUR 54 million) could be needed for the compensation of the pensions in 2014. "If the very first variant is approved of, LTL 178 million (EUR 54 million) will be needed in 2014," said Grauziniene.